I am a lover of tea. I love the way it gives me shelter at any time and wherever I am. In the morning tea gets me off to a good start. In the evening it helps me relax and reminds me that I am home. And during the day it provides a much-needed respite from the daily grind. It is refreshing and healthy at the same time. I adore all types of tea, whether green, white, yellow, red, oolong or black. But my personal preference is Pu-erh tea. It has a long history and is considered by many to be the "King of Teas." I prefer to think of it as the "Wine of Teas." Pu-erh is what we call a "post-fermented tea." Compressed into bricks or "cakes", Pu-erh may be consumed fresh or it may be allowed to age and ferment for up to thirty years or more, its taste constantly improving as it becomes stronger, fuller and smoother. We live in a world where we are constantly bombarded with new technology, inventions, and gadgets. Sometimes, it is good to just sit back and return to the basics. The method with which Pu-erh tea was planted, harvested and processed dates back hundreds of years. Each year when I traveled to the ancient tea gardens in the high mountains of Yunnan, I was impressed by the earth-friendly process the tea farmers utilized to tend these ancient tea gardens. The tea trees were allowed to grow freely in their natural habitat. Each leaf was hand-picked, pan-fried in a wok, rolled and dried naturally under the sun. Because of a regimen honed and perfected through centuries, I am able to enjoy this wonderful tea in the same way my ancestors did during the Tang Dynasty. If you are already a Pu-erh connoisseur, you will find our tea a splendid addition to your collection. If you have not yet had an opportunity to enjoy Pu-erh, we ask you to give our tea a try. 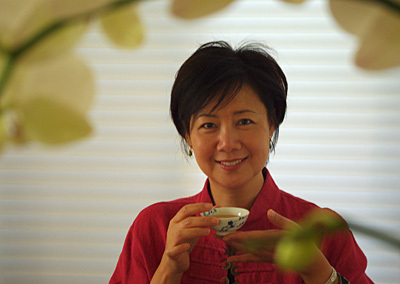 A cup of Pu-erh tea embodies a great deal of history and tradition. Stored to age properly, Pu-erh tea will, like wine, improve with each passing year, its taste transforming magically through time. Let us brew some tea and travel back in time together.